Last night’s dinner was, to say the least, an adventure. I learned four things last night. 1. You should melt chocolate on low heat or over boiling water. 2. How to make caramel. 3. Oil should be 350 degrees and will turn food into charcoal if too hot. 4. Cooking in a kitchen full of Italians is chaos. Actually, chaos does not even begin to describe it. 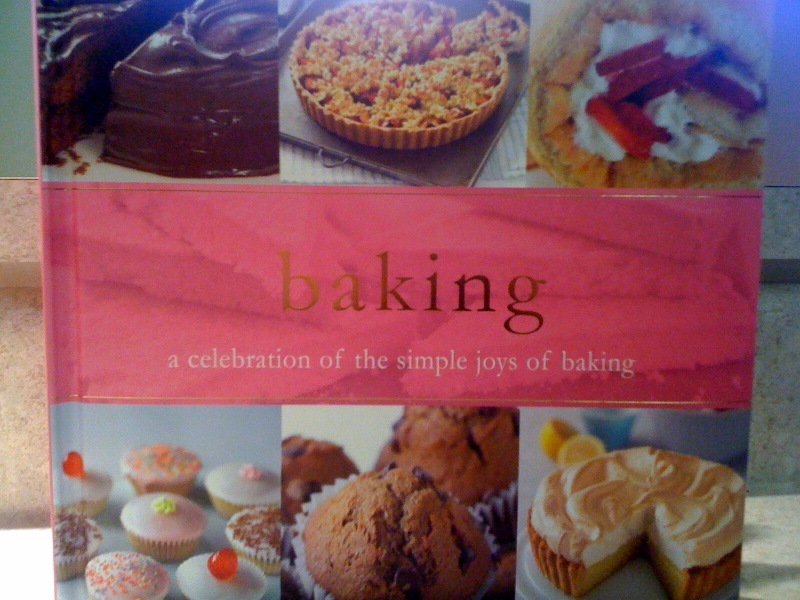 My wonderful sister Gina surprised me with a new cookbook for desserts in honor of my “Kitchen Adventure.” We decide to make a dessert together from the new book for dinner last night and it was pretty good! We made a caramel chocolate shortbread bar. My sister was in charge of the caramel and it turned out great. At first we were getting nervous. I was in charge of the chocolate. I have never melted chocolate so I put the heat onto 3 and walked away for a minute. When I returned my sister was laughing because the chocolate was no longer creamy and had to be thrown out. Good thing she keeps extra chocolate bars around! For some reason the condensed milk didn’t blend well and ended up showing up around the edges of the pan, so we had to cut up the dessert before showing anyone. It didn’t look appetizing, but it tasted great! For an appetizer I had wanted to try something new so I decided to make “Caprese Wonton Salads.” I have never fried anything in my life, and to be honest, I almost burnt down the kitchen. The directions were not very clear and obviously intended for someone with more experience. I ended up heating (on high) about 4 inches of oil (WAY too much). When I put the wonton’s into the oil, they immediately turned BLACK. The kitchen filled with smoke and everyone started to panic just a little bit. Italians are dramatic in nature so you can imagine the scene in my sisters kitchen that ensued. 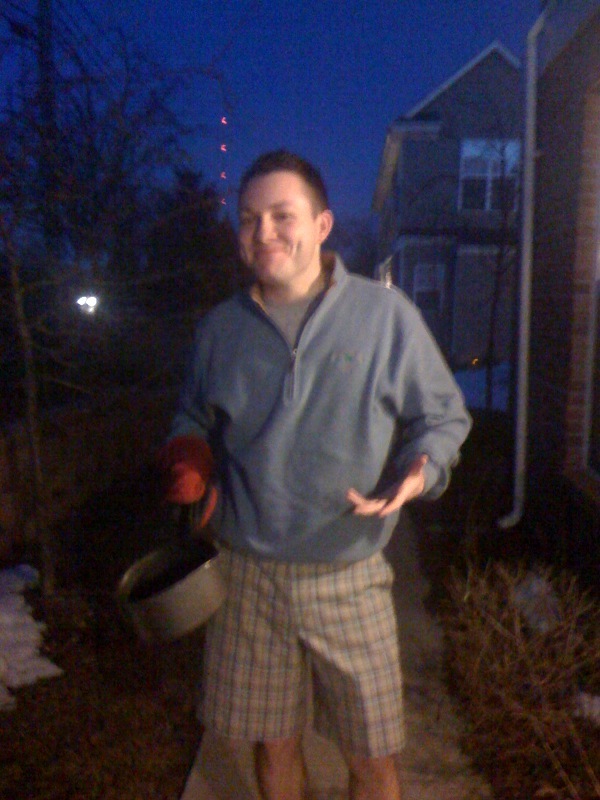 My cousin Tommy came to the rescue and dumped the oil and “lumps of coal” onto a pile of snow in the front yard! We called my cousin Concetta (who actually is a chef) and she properly instructed on how to fry my wonton’s. Once finished they were DELICIOUS. I am so happy we got to try them and a few actually turned out. We brought in one of the “charcoal lumps” and Steve was brave enough to open it up and try the insides, which actually tasted like an oven baked pizza! I can’t wait to make these great appetizers again and am excited I learned how to fry! 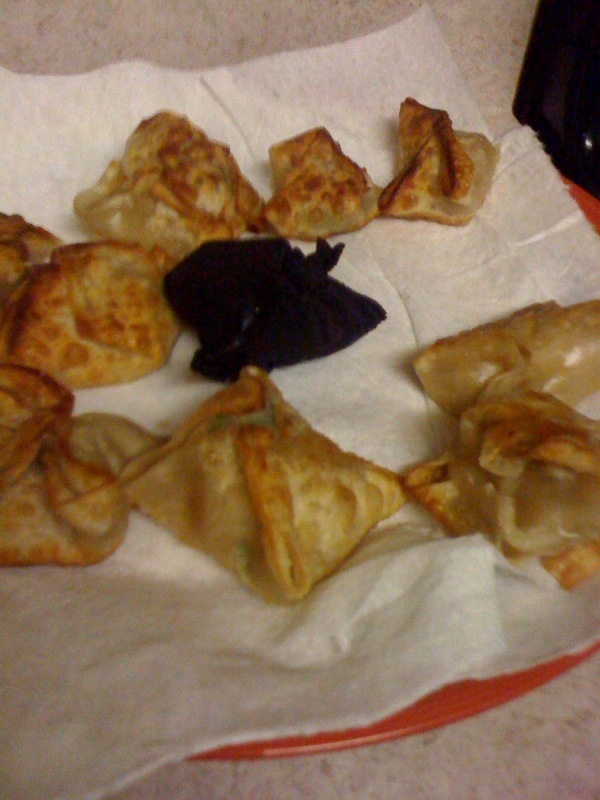 The finished product with the "lump of coal"
Add a slice of tomato, mozzarella and basil leaf to a wonton wrapper. Lightly salt. Dip your finger in water and coat the edges of the wonton, cover with another wonton wrapper. Coat the edges of top layer and fold up. Continue until you have desired amount of wonton’s. Once all wonton are prepared, heat about 2 inches of oil in large skillet to 350 degrees. Do not allow oil to get too hot. Use tongs to set a few wonton’s at a time in the oil and cover with a lid. Carefully watch as the wonton’s will cook quickly. Once the bottom starts to brown, flip wonton’s to other side and allow to cook. Place on a plate covered in paper towels. If desired, prepare a small cup for dipping with Balsamic vinegar. 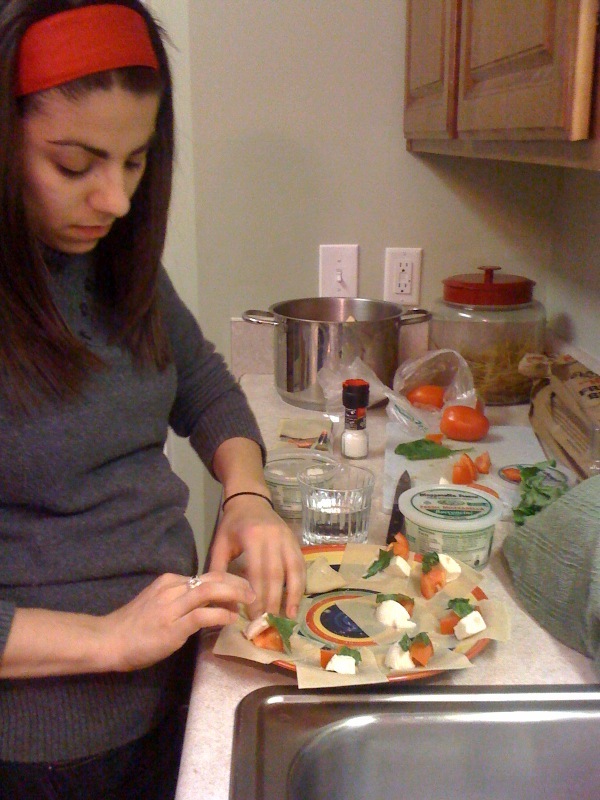 The caprese wonton salads were delicious! I can’t wait to try to make them. I thought the caramel shortbread bars looked exactly like the picture on the inside… I brought them to work today and everyone loved it. When is our next Kitchen Adventure?